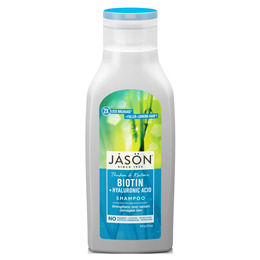 Jason`s pure, natural Restorative Biotin Shampoo gently cleanses as it restores healthy strength to weak, damaged hair. The thickening properties Biotin and Vitamin B5s revitalise hairs elasticity. Ginseng and lavender extracts help repair split ends and minimise future breakage. Fortified with energy, your hair looks healthier and grows stronger. Aqua (Water), Cocamidopropyl Hydroxysultaine, Sodium Cocoyl Isethionate, Glycerin, Sodium Laurylglucosides Hydroxypropylsulfonate, Mentha Arvensis Leaf Oil, Simmondsia Chinensis (Jojoba) Seed Oil*, Aloe Barbadensis Leaf Juice*, Calendula Officinalis (Calendula) Flower Extract*, Chamomilla Recutita (Matricaria) Flower Extract*, Chenopodium Quinoa Seed*, Citrus Grandis (Grapefruit) Fruit Extract*, Equisetum Arvense Leaf Extract*, Lavandula Angustifolia (Lavender) Flower/Leaf/Stem Extract*, Panax Ginseng Root Extract, Biotin, Tocopherol, Tocopheryl Acetate, Alcohol*, Citric Acid, Guar Hydroxypropyltrimonium Chloride, Linoleic Acid, Menthol, Panthenol, Phenethyl Alcohol, Sodium Chloride, Triethyl Citrate, Benzyl Alcohol, Potassium Sorbate, Sodium Benzoate. Gently massage shampoo into wet hair and scalp. Rinse and repeat if desired. Follow with Jason Restorative Biotin Conditioner. 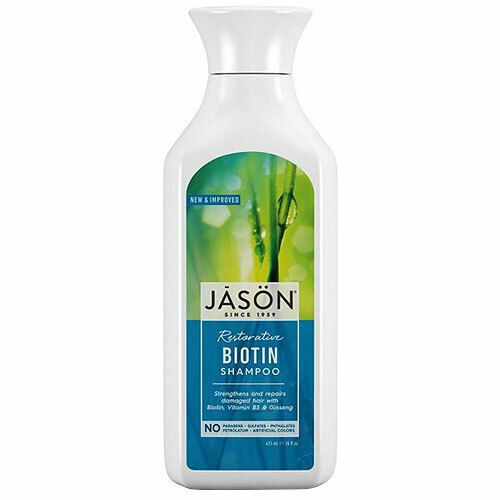 Below are reviews of Jason Restorative Biotin Shampoo - 473ml by bodykind customers. If you have tried this product we'd love to hear what you think so please leave a review.